Below are photos and a brief description of each support station & location. 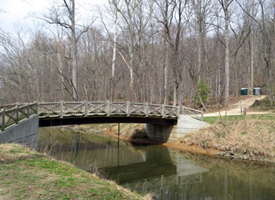 The first support station for 100K hikers is at the footbridge to the Old Anglers Inn, mile 12.28. This is a beverage only stop. This is a popular spot for kayakers and canoeists to put into the Potomac. However, traffic will be light at the early hour when most 100Kers pass by. From I-495 (Capital Beltway), take exit 41 for Clara Barton Pkwy west toward Carderock. After 1.8 mi, turn left at the T-intersection onto MacArthur Blvd. Go 1.1 mi and turn left into an unpaved parking lot, across the street from the Old Angler’s Inn. After parking, walk further down (away from street) and cross the canal over footbridge to the support station. Seneca is located at Lock 24, mile 22.82 (Rileys Lock at Seneca Aqueduct). This station offers first aid and serves as the breakfast stop. Fruit, muffins, bagels, hot drinks, juice and water will be available. From I-495 (Capital Beltway), take exit 39 for River Rd (MD-190) west toward Potomac. Go 11.4 mi to a T-intersection where MD-190 ends. Turn left, still on River Rd west. Go 0.7 mi and take first left onto Riley’s Lock Rd. Continue 0.7 mi to the end; the parking lot is on the left. The support station is in front of the lockhouse. 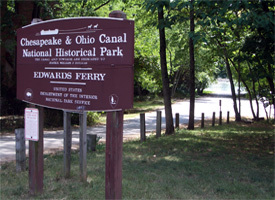 Edward's Ferry support station is located at Lock 24. This is a popular spot for boaters to put in, so be on the look out for boaters. Edward's Ferry offers only first aid supplies (no assistance) and offers various beverages and small snacks. From I-495 (Capital Beltway): Take exit 39 for River Rd (MD-190) west toward Potomac. Go 11.4 mi to a T-intersection where MD-190 ends. Turn left, still on River Rd west. Go 6.5 mi and turn slight right on Mt Nebo Rd. After 1.6 mi, continue straight on W Offutt Rd. Go 0.8 mi and turn at T-intersection onto Edwards Ferry Rd. After 1.1 mi, turn left to remain on Edwards Ferry Rd. Continue 0.1 mi to the parking lot with boat launch. From Points North on I-270: You will use a combination of MD-28 and/or MD-109 to get to Poolesville. After crossing SR-107 in Poolesville, continue onto Elgin rd for 0.1 mi. Turn right onto Wootton Av, then take 1st left onto W Willard Rd. Go 0.5 mi and take 1st right onto Westerly Rd. After 1.5 mi, turn left at T-intersection onto Edwards Ferry Rd. After 2.4 mi, turn left to remain on Edwards Ferry Rd. Continue 0.1 mi to the parking lot with boat launch. From Virginia via Car Ferry: From Leesburg area take US-15 north and turn right on SR-655, Whites Ferry Rd. After 1.3 mi, ferry across the Potomac River; fee $4 one-way, $6 round-trip. The Ferry runs continuously from 5 AM to 11 PM; allow extra time for busy day. After crossing, proceed short distance and turn right onto Whites Ferry Rd, which shortly thereafter turns left and becomes River Rd. After 0.5 mi, turn right to stay on River Rd. After 2.8 mi, turn left to stay on River Rd. After 0.1 mi, take 1st right to stay on River Rd. After 0.1 mi, take slight right onto Edwards Ferry Rd. Continue 0.1 mi to the parking lot with boat launch. 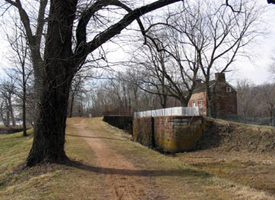 White's Ferry support station is located at mile 35.5 where White's Ferry Road, MD 107, meets the Potomac River. The ferry operates from 5am until 11pm daily. Be careful of cars and traffic. White's Ferry offers first aid and is the lunch stop with fruits, vegetables, sandwiches and various beverages. This is also the starting point for the 50K hike. From Maryland via River Rd: From the I-495 (Capital Beltway) take exit 39, River Rd (MD 190) west toward Potomac. Go 11.4 mi to a T-intersection where MD-190 ends. Turn left, still on River Rd west, and go 1.4 mi. Turn right onto Partnership Rd for 3.8 mi and bear left onto SR-107 (Whites Ferry Rd/Fisher Ave/Whites Ferry Rd). Continue for 8.5 mi (through Poolesville) to the Whites Ferry parking lot. Distance from I-495: 25.6 mi. Take the left fork, onto SR-107 (Whites Ferry Rd/Fisher Ave/Whites Ferry Rd). Continue for 10.8 mi (through Poolesville) to the Whites Ferry parking lot. Distance from I-495: 28.7 mi. From Virginia via Car Ferry: From US-15 northbound from Leesburg, turn right on SR-655, Whites Ferry Rd. After 1.3 mi, take the car ferry across the Potomac River; fee is $4 one-way, $6 round-trip. The ferry runs continuously from 5 AM to 11 PM; allow extra time for busy day. After crossing, proceed short distance to parking lot. 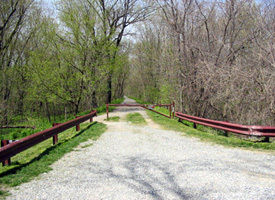 Monocacy is located at mile 42.2 and offers first aid as well as beverages. 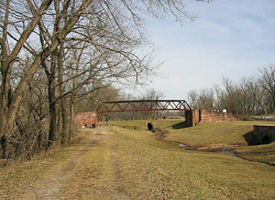 The newly restored Monocacy Aqueduct is one of the most beautiful man-made structures on the Canal. From I-495 and I-270: This is the easiest and possibly fastest way, but there are many alternatives. Go on I-270 and take exit 22 onto MD-109 (Old Hundred Rd) west/south. Go 5.2 mi and turn right onto Barnesville Rd. Go 2.3 mi and turn left onto Mt Ephraim Rd. Go 0.9 mi and turn right onto MD-28 (Dickerson Rd). After 0.3 mi, turn right onto Mouth of Monocacy Rd. After 1.2 mi, bear left and proceed to parking area. From Virginia: From Leesburg area, take US-15 north. About 10 mi north of Leesburg, cross Potomac River and turn slight right onto MD-28 (Clay St). After 4.7 mi, turn right to stay on MD-28 (Dickerson Rd). After 3.3 mi, turn right onto Mouth of Monocacy Rd. After 1.2 mi, bear left and proceed to parking area. Point of Rocks offers both first aid as well as food, and is located at mile 48.2. This is the "dinner" stop and features hot soup and other food and beverages. 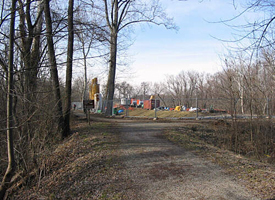 It is located at the point where the towpath merges with a road used by boat owners to launch their boats under the Route 15 Bridge over the Potomac River. From Maryland (I-495 and I-270): This is the easiest and possibly fastest way, but there are several alternatives. From I-495 (Capital Beltway), take I-270 north for 31.5 mi. Take exit 32 for I-70 west. Go 1.3 mi to exit 52 for US-15 south. After 4.7 mi, exit to continue on US-15 (toward Leesburg). Go 6.8 mi and turn left at light onto MD-28 (Clay St). Immediately turn right onto Commerce St, and follow around and parallel to the RR tracks for 0.1 mi. Cross the tracks and wooden bridge to the parking area. From Virginia: From Leesburg area, take US-15 north. About 10 mi north of Leesburg, cross Potomac River and turn slight right onto MD-28 (Clay St). Immediately turn right onto Commerce St, and follow around and parallel to the RR tracks for 0.1 mi. Cross the tracks and wooden bridge to the parking area. Brunswick station offers first aid as well as food. It is located at lock 30; mile 55. After passing the train yard on the right you will see a gate ahead of you. The food stop will be set up on the side of the path beyond the gate. This is the final food stop on the towpath. Snacks, soup and hot and cold beverages are available. From Maryland: From I-495 (Capital Beltway), take I-270 north for 31.5 mi. Take exit 32 for I-70 west. Go 1.3 mi to exit 52 for US-340 west. After 12.2 mi, exit onto MD-17 south/east (Burkittsville Rd). After 1.3 mi, turn right at the light to stay on MD-17. After 0.9 mi, come to traffic circle. Go two thirds of the way around and exit following signs to A St and MARC station. Take 1st right onto Maple St. Continue 0.1 mi and park in train station lot. The support station is directly ahead on Maple, across the towpath. From Virginia: From Leesburg area, take VA-7 west. About 3 mi from Leesburg, take exit onto VA-9 west (Charles Town Pk). Go 4.7 mi and turn right VA-287 (Berlin Pk) north. After 6.6 mi, in downtown Lovettsville, turn left onto W Broad Way (VA-673) and take an immediate right to remain on VA-287. After 2.4 mi, cross Potomac River and continue straight on MD-17 for another 0.5 mi before coming to a traffic circle. From the circle, take the 2nd right following signs to A St and MARC station. Take 1st right onto Maple St. Continue 0.1 mi and park in train station lot. 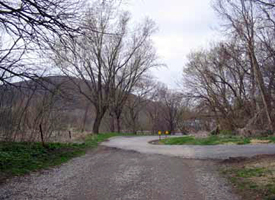 The support station is directly ahead on Maple, across the towpath. Dinner, blister guru's, rest, first aiders and celebration are all in order at the Bolivar Community Center, the end of the One Day Hike. A complete hot meal with a vegetarian option and a variety of beverages await hikers here. The Center is reached after walking a mile through Harpers Ferry. Family and friends can meet ODH hikers here. Parking for friends & family - as well as those picking up hikers, is available across the street in the bank's parking lot. Do not park in side (residential) streets near BCC, adjacent to it, or in its parking lot, which is needed for hiker and equipment drop off/pick up, and for the shuttle bus. Cars there may be towed at owner expense. If you need to park for more than a few minutes, park across Washington St from BCC, behind the Bank of Charles Town (BCT) building. Follow directions below and on the map; a volunteer at BCC can also direct you. From Maryland I-495 (Capital Beltway): Take I-270 north for 31.5 mi. Take exit 32 for I-70 west. Go 1.3 mi to exit 52 for US-340 west. After 19.6 mi (and 3 mi after crossing the Potomac River and 1 mi after crossing the Shenandoah River), turn right at the light onto US-340 Alt (Washington St). After 0.7 mi, turn right onto Panama St; BCC is on the right. To park for more than a few minutes, pass Panama St and take the next left turn onto Cleveland St, and an immediate left into BCT parking lot. Distance from I-495: 53 mi. From Virginia I-495 (Capital Beltway): Take exit 45, VA-267, west toward Dulles Airport. (NOTE: This is a left exit from I-495 northbound, and a rightexit southbound.) Stay on the Toll Road; do not take the Dulles Access Road. Continue for 12.2 mi, going past Dulles airport, to the toll plaza for the Dulles Greenway. After 12.1 mi, take left exit 1A to onto VA-7 west. Go 4.9 mi and take exit onto VA-9 west (Charles Town Pk). Follow for 9.8 mi, and take slight right onto SR-671 north. Go 7.6 mi and turn left at the T-intersection light onto US-340 west. Go 2.6 miles, crossing the Shenandoah River, and turn right at the light onto US-340 Alt (Washington St). See map. After 0.7 mi, turn right onto Panama St; BCC is on the right. To park for more than a few minutes, pass Panama St and take the next left turn onto Cleveland St, and an immediate left into BCT parking lot. Distance from I-495: 51 mi.